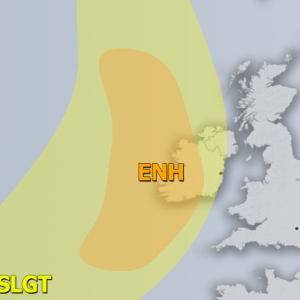 A broad, virtually stationary low persists over the British Isles and Ireland over the next 3 days. A long wave trough associated with the low slowly pushes across western Europe towards the Alps and the northern Mediterranean. 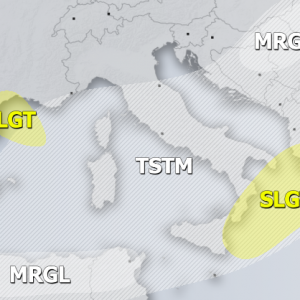 It virtually stalls on Thursday, but still forms a cutoff low over the Ligurian sea and NW Italy. The cutoff low slowly pushes across the northern Mediterranean / southern Alpine region on Thursday and Friday, with the surface low moving across north Italy and the frontal system reaching far south into the central and even southern Mediterranean. This system will produce torrential rainfall and excessive snowfall in parts of the Alps and Apennines in SE France, north Italy, western Slovenia and NW Croatia on Wednesday and Thursday. The main severe weather threats with this cutoff low will be torrential rainfall and excessive snowfall at higher elevations. The southern Alpine flank will receive combined convective and orographic rainfall. Some low to locally moderate instability (MLCAPE 200-600 J/kg) will be available, combining with strong upslope flow from strong southerly to southeasterly winds advecting moist airmass from further south in the Mediterranean. In addition, the cold front will move only slowly, producing training cells and prolonged torrential rainfall also in the lower areas of north Italy and the northern Adriatic region. Up to 200-250 mm of rainfall is expected along the southern Alpine flank, with cumulatives above 80-100 mm along its entire length. Also expect up to ~100 mm of precipitation in NW Slovenia, southern Croatia and into SW Bosnia and Herzegovina. Significant flooding is possible locally, particularly in areas where the slowly moving frontal line dumps large amouts of rain. Current water levels across the region are mostly low due to the prolonged droguht, so flooding potential will likely be somewhat diminished compared to similar situations in autumn. Large amounts of snow are expected at higher elevations across western and southern Alps. Particularly the Alps of NW Italy and S Switzerland will likely receive up to 100-150 cm of snow, locally possibly even over 200 cm! Snowfall totals over 50 cm are expected across a large part of western and southern Alps. Snowfall will begin at quite high elevations, approximately 1400-1700 m, but will gradually push below 1000 m along most of the southern Alps, and even lower across the western Alps. Expect some snowfall also across central and northern Alps, also pushing below 1000 m, but totals will be smaller than elsewhere (mostly below ~50 cm). Some severe thunderstorms will be possible along the coast of the Ligurian sea, across the Po plain into the northern Adriatic and NW Croatia on Thursday. Up to 300-700 J/kg MLCAPE will build up in the coastal area of Liguria and Tuscany, overlapping with very impressive deep-layer shear! 40-50 kt 500 mbar southwesterlies will overlap with 30 kt surface southeasterlies and impressive veering vertical wind profiles. While overall instability will be fairly limited, any discrete storm in this environment will be rotating. Significant low-level (0-3 km) CAPE will be available ahead of the frontal line, overlapping with 20-30 kt 0-1 km shear. Tornadoes will be possible with any discrete thunderstorm in this environment. Expect a squall line with embedded rotating updrafts to push across the Ligurian sea in Wednesday evening through Thursday morning. Low to moderate instability will build up across the central Po plain during the day, with up to 500-700 J/kg MLCAPE. Quite strong surface southeasterlies (20-30 kt sustained) will overlap with 40-55 kt 500 mbar southerlies, producing a strongly sheared environment with some noteworthy helicity. Supercells will be possible, particularly along the triple point in the region between Brescia and Mantua. 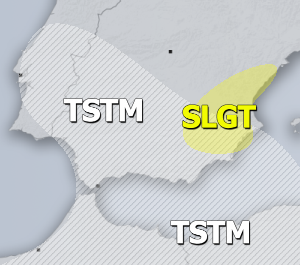 Severe potential will be limited, however, torrential rainfall and up to marginall large hail is possible. A tornado is also possible with any storm that forms in this environment. While there will be ample upper level forcing, the likely limiting factor for severe storm development in this region will be limited instability. A major squall line is expected to develop across the Adriatic sea along the cold front. Strong Scirocco winds will develop ahead of the front, reaching sustained speed of up to 70-75 km/h and gusts up to 100-110 km/h. By this time surface and mid-level winds will likely be aligned, producing unidirectional shear and little veering. Expect a squall line with rotating updrafts more likely along its southern part. Main threats will include severe winds and torrential rainfall. Please refer to our Severe weather outlook for daily forecasts.